Search Engine Optimization (SEO) is the best way to get your website ranking on Google. But how exactly do you implement SEO into your posts and pages? Much of the advice you’ll find online is outdated, or simply isn’t actionable. That’s why we’ve put together a list of tips – things that you can do right now to improve your website’s ranking. You’ve probably heard that “content is king.” Everywhere you look, you’ll find that phrase over and over again. And it’s true! What they don’t tell you is that it’s only quality content that is king. You can update your blog every day with new content, and it won’t make a bit of difference if that content isn’t useful and engaging to your audience. So focus on creating content that either teaches or entertains. Once upon a time, SEO focused on short keywords and phrases people would type into a search engine. While this is true to a certain extent, today’s algorithms are focusing more and more on voice search. After all, 40 percent of adults now use voice search at least once per day. Those searches are phrased differently than text searches and will often bring up very different results. Voice search is the future, and it’s best to be ahead of big trends like these. When it comes to ads, you want to create something that is fun, funky, and entertaining. You also want to make sure that you’re advertising in the right place. While Facebook was once the most popular platform for advertising, recent changes to the site have made getting your content seen on the site more difficult. Instead, consider focusing on highly active platforms like Instagram and Reddit. And don’t underestimate Google Adwords – their “Shop the Look” feature for clothing and interior design businesses is especially useful for reaching mobile users. Speaking of mobile users, most people these days will be accessing your content through their smartphone. That means keeping your site fast – no longer than two to three second load times. Anything more and most users will get frustrated and move on to something else. There are several tools you can find online to test your site’s speed. If you have a lot of older content on your site, now is the time to update it. Consider beefing up shorter articles into long-form content. Or, even better – repurpose old written blogs into new video content. More and more people prefer video to written content these days. In fact, over 500 million people are watching video content on Facebook every day. If you’re not creating videos, you’re missing out on a huge audience. Customer reviews are increasingly important when it comes to search engine rankings. Have a system in place to ask for customer reviews. When people are searching for businesses, the businesses that are nearby that have the most reviews will get priority in Google’s search results. 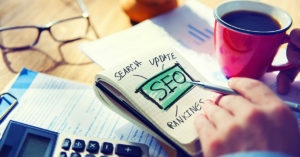 Finally, it may be best to consult an SEO professional. Have them give your site or blog a quick once-over and identify any real problem areas. We have a team of SEO experts who are ready to help you get your site rising in the ranks so you’re getting more views, conversions, and product/service reviews.